First of all, thank you PinkPearBear for the nomination! Second, thank you to my husband for letting me have the time to write this all down and edit it! 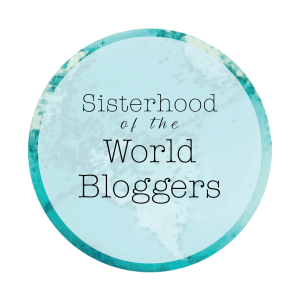 :3 The award is, “Sisterhood of the World Bloggers,” and she has asked that I answer four questions. Here it goes! 1. If you ever got a tattoo, what would you get and where? I would love to get red dragon wings on my back, probably around the area of my shoulder blades. It would suite my personality brilliantly. I’m a passionate person that puts everything I have into anything I feel is worth doing. 2. What is the one hairstyle you’ve always wanted but never dared try? The only one I want to do that I’m afraid to do is buzzcut short. I don’t like how hot it is in the summer, and I would greatly prefer to have no hair anywhere at all. Unfortunately, my husband would die from laughter, and I like having him around. I’m a practical person and this is one of those areas where he finds that weird. I did go pixie-short this year. Who knows, maybe I’ll buzz-cut it next year. 3. Do you have a dog? Nope, no doggie. I somehow became allergic in the time between moving out of my parents’ house and moving into a place that allows pets. 4. Which country would you visit first if you came into some money? If I came into money, and someone to take care of my son, and the patience to sit on the flight, I would go to Australia. It just seems like my kind of place, and not JUST because of The Rescuers Down Under which I might’ve been mildly obsessed with as a child. NOW I need to nominate people. Apparently the normal amount is ten, but that’s way too much for me as well. I like the idea of three as well, so lets go with that! I nominate Katestrophe and The Purple Rose Blog because their likes brighten my day. I nominate excoda because I can tell by reading it that their blog is important to them, even if it’s on the new side. In order to accept this award you must copy the award logo into your blog, link back to my blog, answer the four questions below, nominate people (I did three, but up to ten), and ask your own questions of your nominees (I did four, but up to ten). 1. What’s your favorite activity to do when you’re alone? 2. If you could choose one food to eat for the rest of your life (and never develop health issues from doing so), what would it be? 3. What’s your favorite book of all time? Why? 4. What’s the longest amount of time you’ve spent by yourself?